This canine skill has been put to good use for decades, in the form of drug-sniffing dogs at ferry terminals and airports as well as the Army’s bomb detection canines. But, in recent years, teams of researchers have been developing what is potentially an even greater breakthrough. 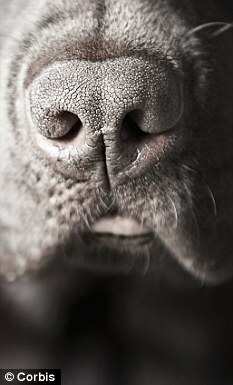 Recent research (in Germany) discovered that dogs could sniff out lung cancer from breath samples of sufferers. The four dogs in the study learned to get it right 71% of the time, too high to be mere coincidence. Can a dog smell cancer before doctors can diagnose it? Trailblazing UK charity, Medical Detection Dogs not only train dogs to sniff cancer, but also is responsible for training ‘Medical Alert Dogs’ which live with people who have health problems. They have taught 22 dogs to recognise when a diabetic’s blood sugar gets low and alert them to stop hypoglycaemia, aid narcoleptics by working out when an attack of sleep paralysis is about to start - and may soon be able to teach dogs to tell when someone with a severe allergy is about to have an allergic episode. This all relates to the same idea - that dogs can recognise the minutest changes in smell when certain processes happen in the human body.